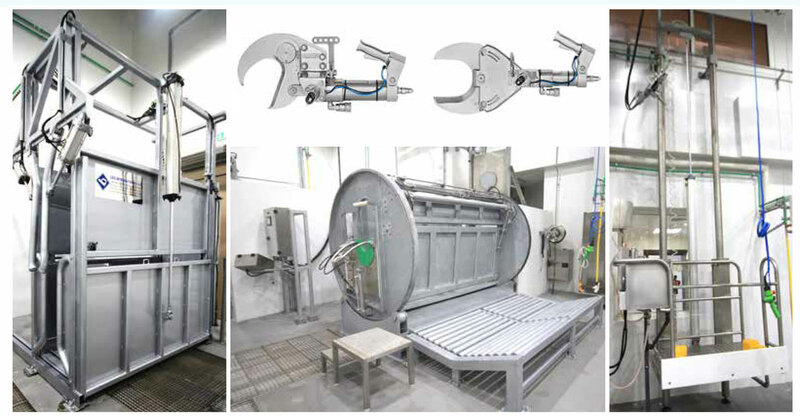 Being among the largest in our fields, we develop the abattoirs that are highly efficient and productive. The facilities we develop with all the technologically advanced features are yet to be paralleled in the region. Our innovation and drive to bring out extraordinary have enabled us to deliver the facilities that have served the needs of renowned national and international clients. 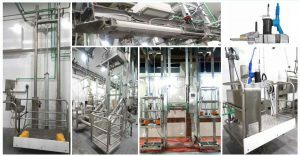 The facilities we develop are capable of handling all of the operations of the slaughtering process, carcass dressing, meat cutting, further process the product. Not only this our vessels are even, well equipped to conduct scientific treatment of by-products, using modern methods and techniques that comply with the highest hygiene practices and international regulations and standards. All our facilities are highly sustainable and efficient in handling related operations such as recycling of solid and liquid waste and possible utilization of biogas produced from the process. Keeping in mind the modern shift of using renewable energy sources, we are constructing our facilities that are efficient to operate on power generated by wind and solar energy. Before each and every project we conduct a careful and thorough environmental impact assessment study and constantly refer and adhere to it, during the design, building and operation process. 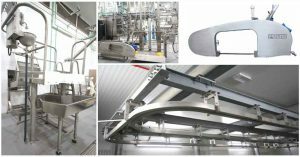 We have smartly designed separate lines for sheep/goat and cattle/camel to serve the different requirements. Firstly, we conduct a brainstorming session with the client to better understand the requirements. Then, after realising the production capacity of small and big animals, we document the facility and plot such as total area, location and Qibla direction and understand the budget restrictions and allocations. We conduct deep research to realize the standards and norms that customer is adhering to. 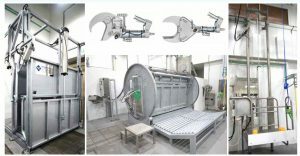 The highly experienced team discusses with the architectural consultant and the client making them fully aware of the space requirements, especially in the context of the by-products of the slaughtering and dressing process as well as the requirements of the MEP and structural restraints to conceive and finalize the design criteria. 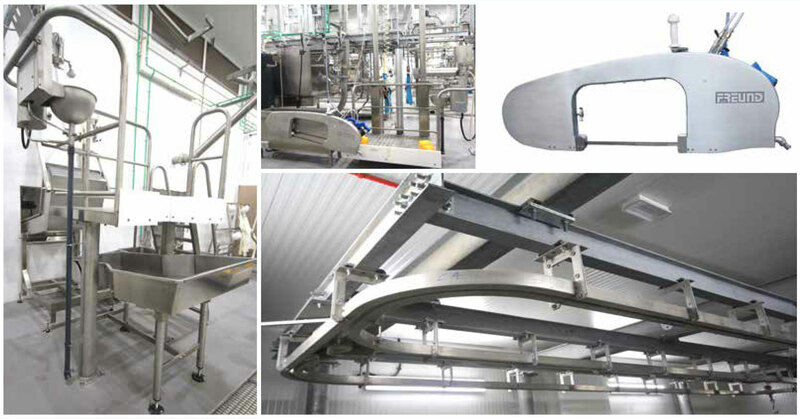 The team design the rail system, conveyor and equipment for and small animal production lines. The expert team then designs the cold store and capacity required by the client. We prepare B/Q for the approved design. After this, we prepare utility schedule and points for electric, water and the pneumatic requirement for the processing equipment. The team focuses on the design of the drainage system within the processing hall. We conduct thorough research to understand the load requirement to the main steel structure which will hold the substructure for the rail hanging system. Our team coordinate with the main contractor/consultant to prepare the final drawing for Abattoir equipment, rail/conveyor system and its relevant sub sustaining structure. We meet with the consultant and client at various stages of the design process and attend progress meetings during erection and building stage. Upon completion, we conduct Dry and Wet commissioning of all equipment in the presence of the client and consultant. After completion of the project, we conduct training sessions for a few months and ensure that the operators are fully acquainted with the use, maintenance and cleaning of the various equipment. While conducting the training session our technical team try to find out the minor disturbances in the facility and if found fix them immediately.